On 14 November 2014, a monument was inaugurated in the Trefort Garden on the campus of the Eötvös Loránd University’s Faculty of Humanities (ELTE BTK) in memory of former staff and students of the university who as a result of anti-Jewish laws died during forced labour, or lost their lives in concentration camps and ghettos, as well as all those who met their death while serving in the army and as civilians. ELTE BTK and the Master Association of Architects (ÉME) had announced a competition for students of ÉME’s Master’s studies under the title Trefort Garden Monument Competition. The winning design was submitted by the “MM Group” whose members were architects Ildikó Bujdosó, Eszter Lukács, Nóra Szigeti, Dénes Fajcsák, János Roth and Levente Szabó, students and lecturers of ÉME’s Master’s studies course, 22nd Cycle, along with sculptor Farkas Albert. The title of their work is Names in Mortar Joints and the names of 198 former lecturers and students have been engraved on a bronze strip surrounding the Trefort Garden. Scale is their key concept. Their work is simultaneously enormous and almost impossibly tiny. It is both total (connecting the two streets bordering the campus) while at the same time an unnoticeable intervention in the Trefort Garden. It is able to express the unique and dramatic loss of the university’s history connected to that era, but it does not put it in the focus of the current university community’s everyday life. It makes possible both keeping away (in which case, a hardly noticeable strip remains on the walls) and going close, understanding as well as remembering (the decipherable names, the mass of data and the spatiality encompassing the whole garden may create a connection with the memory of the victims which is more direct than any symbol or further explanation). 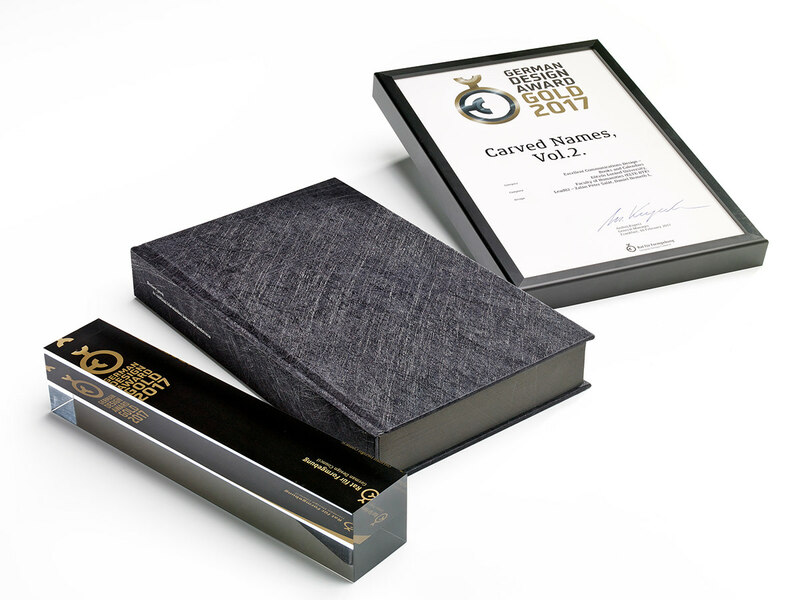 The double volume Carved Names was presented a year after the inauguration of the monument, in November 2015. 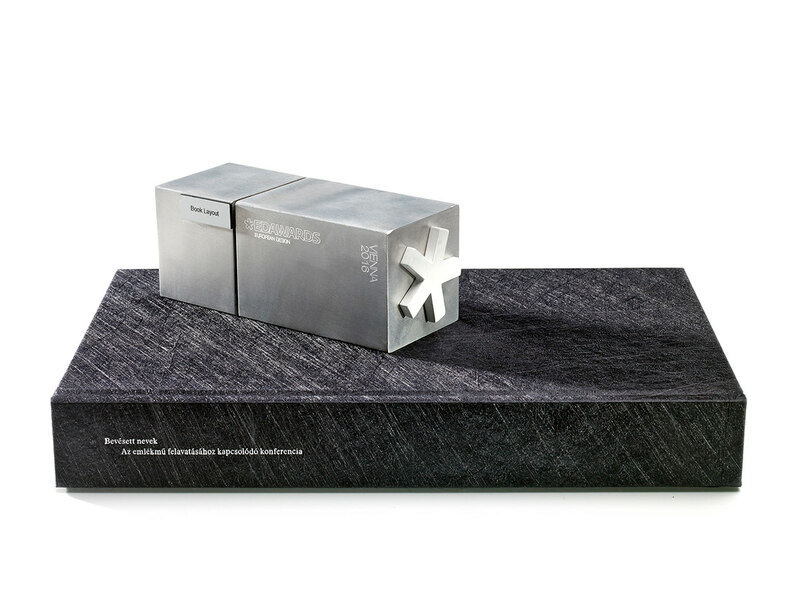 The white volume contains the designs submitted to the Holocaust and World War II monument competition announced by ELTE, while the black volume includes the conference lectures with reference to the inauguration of the monument. Remembrance is silent, remembrance is unequivocal, remembrance is diverse, remembrance is intuitive and remembrance is inspiring. 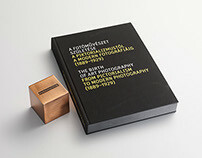 Can typography and book design transform it, if not into words but a form? How is it possible, on paper in a tactile object whose pages can be turned, to summarise the research process, during which ELTE began to explore the story of its students and lecturers who met a violent death during World War II? Can graphic design reflect on a monument which, building upon the toolbar of typography, has recorded the names of 198 victims in the Trefort Garden and emphasised that it wanted to simultaneously make possible keeping away, going close, understanding and remembrance. What possibilities do book designers have to present the studies of a scientific conference with regard to the theme and the results of a competition announced for monuments to be designed by university students? 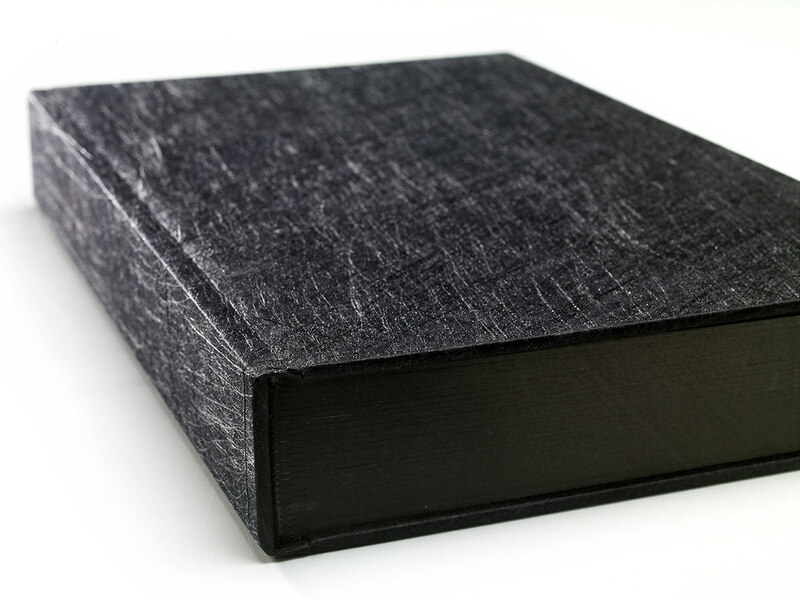 A pair of black and white volumes with engraved, painted book edges and visible cotton threads provide the answer to the questions. 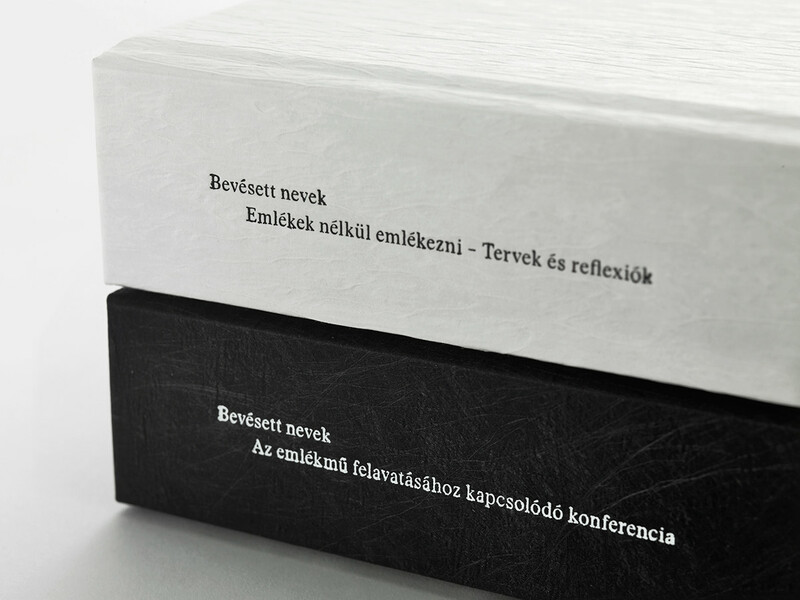 The white volume of the two books gathers the designs submitted to the competition of a Holocaust and World War II monument announced by ELTE and the black volume contains the lectures presented at the conference connected with the inauguration of the monument. 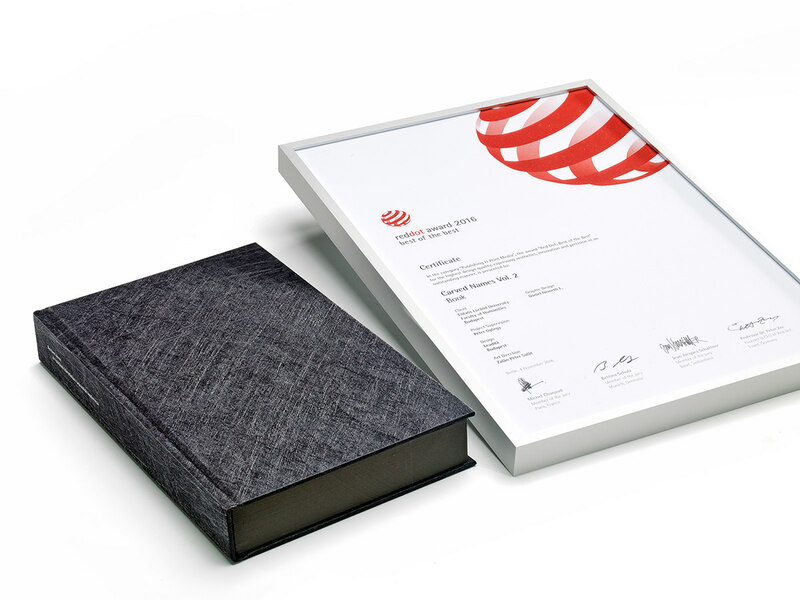 The art director of both volumes was graphic designer Zalán Péter Salát, winner of the German Design Award Gold 2015. 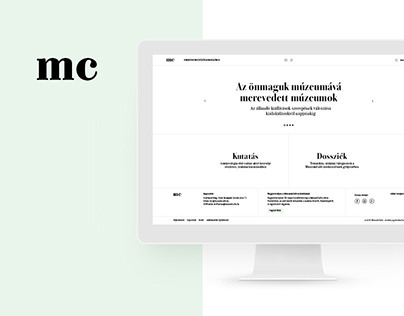 The white volume was designed by Ákos Polgárdi and the black one by Dániel L. Németh and Zalán Péter Salát. The white volume is as varied as the designs by students submitted for the competition. 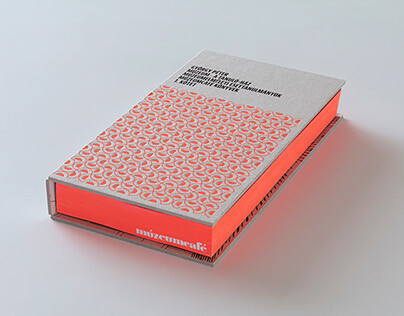 The book design follows the latest international design trends with a plethora of typographic elements beyond the settled visual world, and a play with sizes and forms provides an experience for the reader. 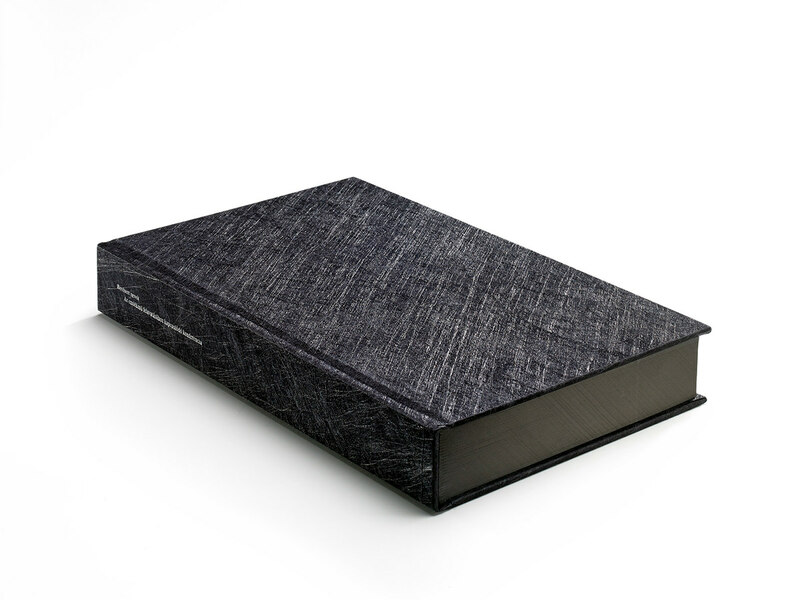 The puritan appearance of the conference volume represents the humility of science, the force of concentration and the calmness of thinking. Form remains merely a tool and the designer actually draws attention to the content by means of the dispensability of design. 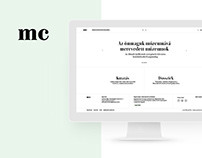 The dialogue between simplicity and elegance offers the opportunity for absorption where the designer intensifies the minimalism of typography to the extreme. In the black volume, only a single size of a single font, in only normal and italics can be found. The designer’s acceptance of this provides the feeling of reading a printed version of essays with distinguished academic content on A4 paper in the most ordinary Times New Roman font. Stanley Regular, an adaptation of Times New Roman designed by the Swiss Optimo Type Foundry in 2012, is applied in the book. The unusual approach at first sight is the conceptual manifestation of remembrance that characterises the whole project connected with the monument. The homogenized typography is a metaphor, which refers to the intention of destroying diversity – to the consistent practice of the Holocaust when state power sentenced all its discriminated citizens to the same fate without exception. The absence of typographical variety symbolises the destroyed individual and the personality deprived of happiness. At the same time, the omission of highlights, spectacular titles and graphic elements does not leave the often hierarchic world of academic life and remembrance culture untouched. All the components of the written content in the volume of studies have an identical meaning. Just like the university’s names of the dead of different origin, age, fate and rank are randomly presented next to each other on the bronze surface of the monument, the authors of different ages and background are also equal. They together research and analyse in a holistic way the trauma which was caused by the victimisation of the university’s members in all senses by the anti-Jewish laws, the Holocaust and the events of World War II. 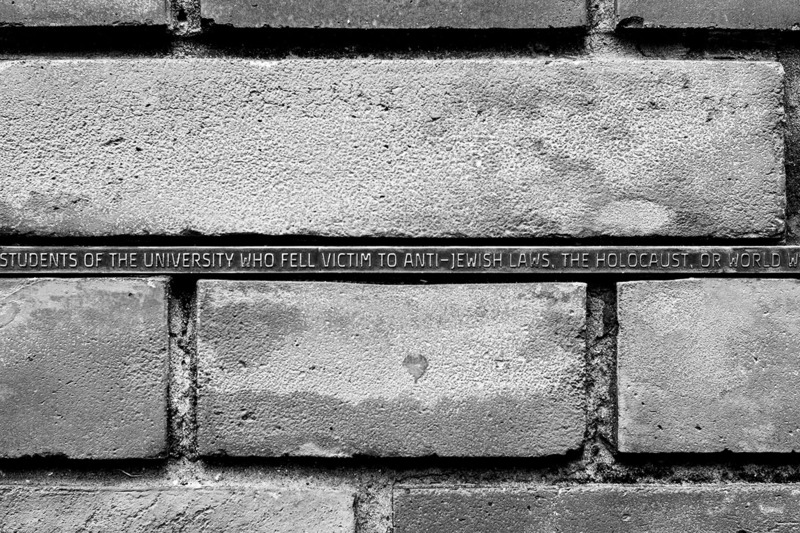 The names, dates and places of birth and death of the university’s victims can be read in 9,454 characters in a ribbon-like manner of a total length of 200 metres on the walls of the university buildings. In a similar manner, the nearly one million-character-long flow of text in the volume of studies provides the sensation of reading which is both horizontal and elongated. Its attainment is the “request” of the erected monument for those remembering. In the volume the text does not flow block-wise in the middle of printed sheets marked by an emerging black cotton thread, but lines and paragraphs reaching across to the other side break up the image generally considered the visual appearance of book pages, and thus the usual reading practice. The typographical system creating the arrangement of the text itself becomes a book illustration. In an untraditional manner, footnotes are not separated from the body text. The notes set in bronze coloured letters are inserted in the text where they belong – meanwhile they create the design image of the close-up details in the brick wall–mortar joints–bronze strip connection. This makes their treatment and interpretation easier and the colour change also presents the opportunity for passing over them. The elaboration of the relationship between detail and whole is as much an important part of memory as the emphasis of continuity or connecting points. Using a single font and a single size, the book designer has no other choice than to operate with space. Similarly to the Trefort Garden, a series of scale shifts have been achieved with the lines going across the book spine and the thus created spaces that have been left empty. Despite the constancy of font and size, the antonyms of near and far, small and large, tall and low, much and little, succeed. By moving the pages the text patterns take a different form optically and their meanings vary depending on the way of reading and looking. 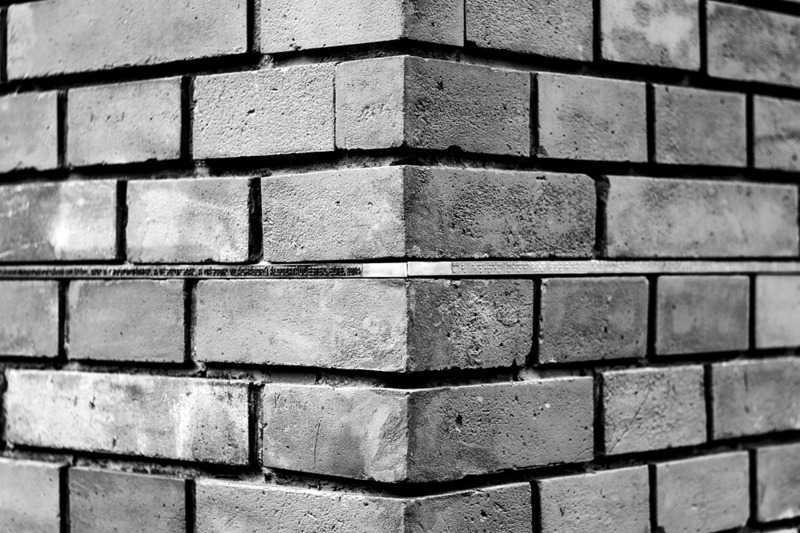 This echoes the work Names in Mortar Joints, whose bronze strips always go round at the same building height yet force viewers to continuously change their viewing point, since the names seem to be sometimes higher or lower due to the constant change of ground level. The graphic designer’s space experiment is a response to the architectural space experiment. Due to the lines going over the middle of two pages and the visible thread used for binding the book, typo-images have been created, which can be interpreted as independent works of art. The designers have created 27 such facing pages where individual shapes and formations have come about. By making the void left behind visible, the compositions generate disturbance. The typographical silence, the absence stretched to the present, represents the place of loss, the unborn works, discoveries and successors. ‘Page wasting’ seen in the volume can become the synonym of wasting human life and human talent. The ribbon-like lines become highlights, even in the apparent typographical homogeneity, while the parts of the body text have remained, yet the content has received a stronger meaning. The meticulous use of twenty-seven linear memento signs makes the reader aware of the Prussian like system of lay-out rules which the designers created for the volume, but in which the text shapes itself into a coherent system. The soul of the book design is provided by these twenty-seven so-called ‘thread page pairs’, which also represent the pictorial illustration of the black volume after omitting the photographs and graphic elements from the book. The art director’s expressed aim is to make readers think, slow down and stop. It is not a publication of a ‘book and go’ that can be paged through on public transport. 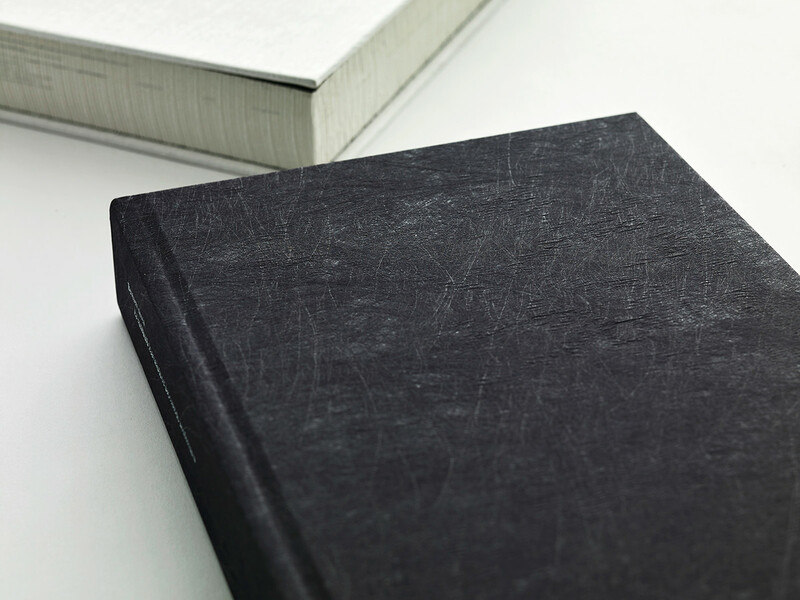 The two volumes demand dedicated attention from the reader and with that it is also similar to the remembrance discourse connected to trauma therapy. The overstretching lines may also be interpreted as a connection between generations. The design has moved the text typographically, yet it has not become inappropriate for silent remembrance and homage. Thanks to Péter György, Noémi Farkas, Teri Szűcs, Árpád Szendrői, Ákos Polgárdi. We owe many thanks to Marianna Berényi who helped us drawing up the concept. 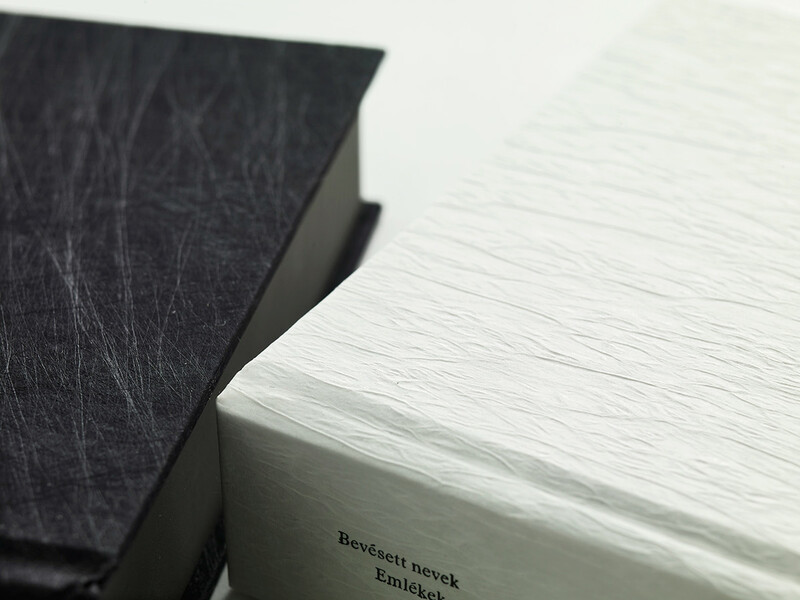 Paper: Munken Pure Rough 120 g/m2 – Arctic Paper S. A.
Engraving of book edges: Vladimir Fyodorov – Előzék Ltd.
Angular and black like a briquette from the outside, with uncompromisingly pared-down typography on the inside. There’s no doubt about it – this book really is something special. By soberly listing the names of the victims page after page, it manages to provoke an emotional response from the reader. Purism of this kind requires a great deal of work, pas- sion and care, but above all it also requires an absolute wealth of experience in typography and the craft of bookbinding, which explains why the result is so extraordinary. Kantig und schwarz wie ein Brikett von außen, innen kompromisslos reduzierte Typo. Keine Frage – dieses Buch ist etwas Besonderes. Nüchtern listet es die Opfer Seite für Seite auf und schafft es gerade deswegen, den Betrachter zu berühren. Dass eben dieser Purismus viel Arbeit, Leidenschaft und Sorgfalt, vor allem aber ein Höchstmaß an Erfahrung in Typografie und Buchbindekunst erfordert, erklärt, warum das Ergebnis so außer- gewöhnlich geworden ist.